Extra Open Sundays on 28th April and 5th May! 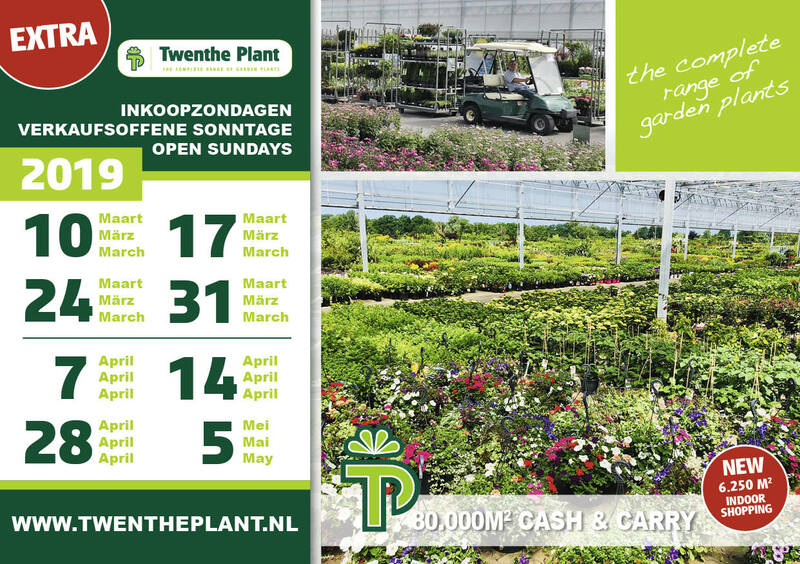 Twenthe Plant organizes extra Open Sundays on the Cash & Carry (with 80.000m2 garden plants) so you can be more flexible during the season. We know that our customers are always short on time during the season and therefor we give you the possibility to visit and purchase your garden plants also on the Open Sundays below. Also we have extended opening hours in the months March, April and May. Mark the Open Sundays in your agenda or save them directly in your outlook agenda by clicking the agenda icon behind the date. On our Open Sundays we are open from 7.30 a.m. - 4.00 p.m.